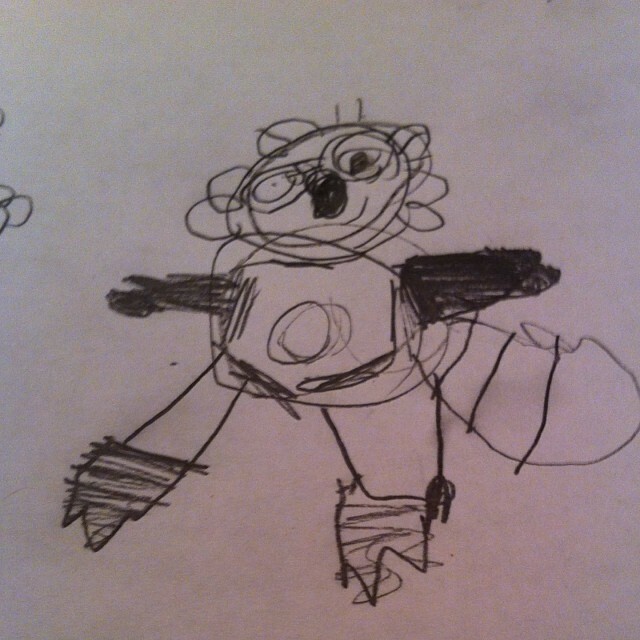 January 10, 2014 ~ Drawing with Dragons | Whatever! « January 10, 2014 ~ First! For Christmas, Nana gave Teagan a book that shows you how to draw things. It starts with a basic shape – circle, square, triangle – and then adds on, bit by bit, to make a tiger, a princess a train. She thought she was supposed to color in the book, and even started a little circle, but stopped when we explained how to use the book. Stu sat with her, with his notepad, while she drew. 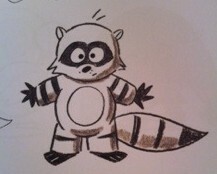 They started with the raccoon. I think she did a great job! This is the image she had the most focus with, she was so eager to draw it, to draw anything from the book. She was so proud of her raccoon. I think he’s very cute! They drew several more things some together, some different. I think Stu enjoyed it as much as Teagan did. He drew a tiger, a duck, a shark. 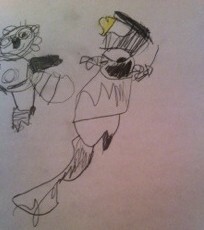 They both did a pirate, though Teagan’s version had a yellow, fire-breathing dragon on his hat. Still. 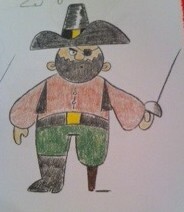 I think she did a great job, she even drew his beard, peg leg and sword! I think her flying fairy turned out pretty good! She even has a smile. Ashlin and I watched Peg + Cat while this was going on. Cat is cool. The girls are always enthralled when this show is on, though this time Teagan was a bit preoccupied. Something I always wanted to do was to learn how to draw. 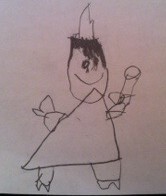 Teagan’s picture are far better than mine ever were! They’re better than my attempts too! I can’t even doodle well. She’s pretty cool, this kid of mine. Thanks Kate. I think G has different talents, more than just having the most amazing curls. Teagan didn’t have art that looked like much until recently, too. Maybe his art will just pop out next week. Yes, I agree…her skills are every good indeed. Keep encouraging her. We would love to see Stu’s successes as well :). Glad the girls can have one on one with either of parents and enjoy themselves. You guys rock. Thanks Kat! Stu enjoys drawing along with her, and coloring, so she gets a bit of encouragement. Up until recently, her drawings haven’t looked like much. It’s nice that they’re finally evolving! He’s very good with them! I do like watching them interact.